Have you discovered that you, too, need to use up all those cucumbers your gardens have blessed you with? Have you made dill pickles from previous bounties? With less than ideal results? Me, too. But, relief is at hand! Today I am going to share a super easy recipe for dill pickles with you. They are super crispy and delicious! As with all pickles, they go great on sandwiches and hamburgers. They also taste great in salads such as macaroni and potato! As you might have gathered from my earlier statement, I’ve had some poor results from previous attempts at canning pickles. As usual, I wasn’t going to let that stop me from canning pickles. I wasn’t willing to give up. Super Easy Dill Pickles for Canning! In my quest for making perfect dill pickles, I went in search of crunchy pickles that wouldn’t use a bunch of special ingredient packets. I found this recipe on The Old Farmer’s Almanac website. I like that you don’t have to use a store bought pickling spice or anything like that. This recipe turned out great. I have made these dill pickles three different times and they turned out great each time! This canning season I thought I would have to try a few recipes out before I found one we liked. I’m so glad that I was wrong! This was the first recipe I tried. If you use organic vinegar, cucumbers, and seasonings, you can make organic pickles, which can be expensive and hard to find in stores. A LOT of Dill Pickles ! Yesterday we picked all of our pickling cucumbers and today I canned them. 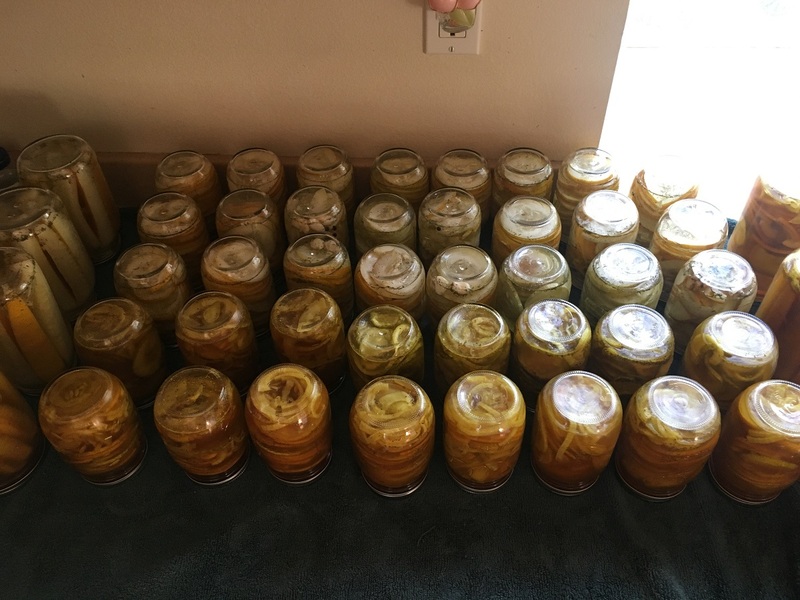 I did 41 pints and 6 quarts of pickles! I would have done more, but ran out of jars. It took about 6 hours and was a lot of work. But despite that work, it is totally worth it, we will have plenty of pickles for our home storage! It’s pretty exciting 🙂 We love pickles in this house, so this just adds to the love I have for not having to buy any pickles for a while! I hope you try canning dill pickles using my recipe. And even more, that you enjoy them as much as we do! Next week I will be sharing my recipe for bread and butter pickles! Add the pickling lime to ice water and soak the cucumbers overnight. Remember to rinse them three times before continuing the canning process. If you don't have, or want to use, pickling lime, then simply soak freshly picked cucumbers in a tub of ice water overnight. In a large pot over medium-high heat, bring 2 quarts of water to a boil. Add the vinegar and salt and boil for 5 minutes. Pour the hot brine over the cucumbers, leaving ¼ inch of headroom. Wipe dry the rims of the jars, then cap each with a lid and screw band. Prepare a boiling water bath and process the jars in it for 10 minutes. Remove the jars from the bath and set them on a towel on the counter. They will “seal” during the cooling-off process. Place any jars that do not seal properly in the refrigerator and use first. If you want sliced pickles, slice them before soaking them. I turn my jars upside down to cool down after I take them out of the water bath to help seal any of the jars that didn't seal during the water bath.